I’m housecat-sitting for my parents while they’re away so expect to see a lot of cat photos from me on my Instagram story. Here’s one of Latte in her new hat I shared to Twitter! Leik if u cri everytim. 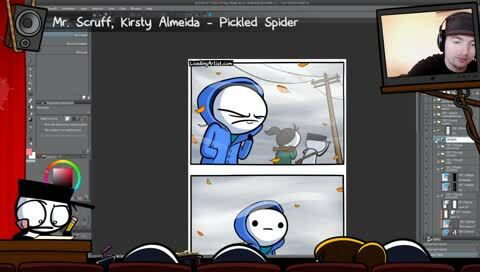 I read all the Loading Artist comics, I watch his streams on twitch, I found all the spiders that were hidden as easter eggs(on newspaper this time) and I have a Loading Artist mug. Look at geogor over there. He againsts the cold wind with no coat. That lady next to him must be veey impressed. And spider in place everybody has found by themself before read this right? At the stream. Also, found the spider! I have officially read every LoadingArtist comic! I can die happy now. Spidey is looking better thank you. In Soviet Russia, spider finds you. Found the spider! Really easy this time. It’s right on Gregor’s hat, where he’s pointing at the supporters and holding a star. You may worship me now.